What was it like to fly one of the most recognizable high-altitude bombers during the Vietnam War? One of our docents, Dave Wellman, flew B-52s during Vietnam and shares his experiences in this historic plane during afternoon talks at the Museum. Wellman’s talks illustrate some little-known facts about how SAC (Strategic Air Command) modified their nuclear bombers and used them to support America’s mission in Vietnam. Early D and F designs of the B-52 seated five crew members in the front and the gunner in his own compartment in the rear with four 50 caliber guns. This compartment, however, lacked an ejection seat and gunners rarely survived any uncontrolled bailouts. In the G model, all crew members sat up front and the guns were taken out after the war. 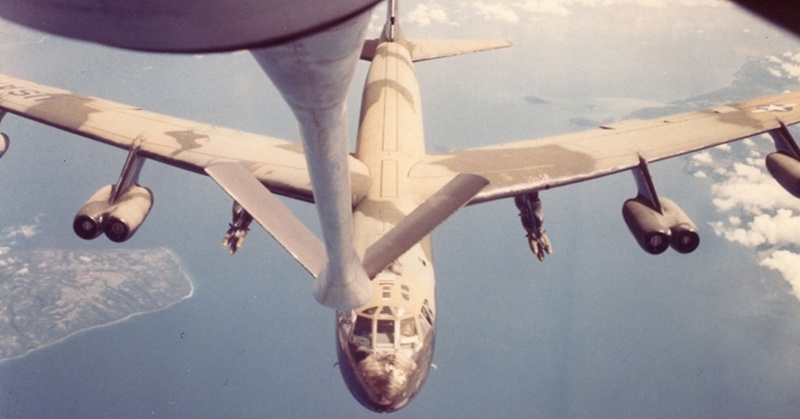 The flexible and innovative design of the B-52 allowed it to carry a variety of bombs that were used to break the Iron Triangle and other Vietcong strongholds. B-52s carried 500 lb., 750 lb., and 1000 lb. bombs which were loaded by hand. “That’s the worst job you could have, being a load guy in Guam,” Wellman says. B-52s also carried small BLU-3B “bomblets,” colloquially known as “pineapples.” These 2 pounders were classified as cluster bomblets and they were used against personnel and unarmored targets. These were dropped only at night from altitudes of 8000-10000 ft.
Nearly 7 million tons of bombs were dropped in Vietnam, and the B-52 carried roughly a third of these. By comparison, in WWII total all Allies dropped about the same amount that B-52s did in Vietnam. The first B-52 models were deployed to Guam on February 11, 1965. On their routes to Vietnam, B-52 pilots could not fly over the Philippines because the country forbade the U.S from flying live ordnance over it. Instead, B-52 pilots flew north of Luzon to Vietnam. Similarly, B-52s were removed from Okinawa—Japan would not allow American aircraft that were nuclear capable. Japan did, however, allow the U.S. to station tankers there. After completing bombing missions, Dave’s B-52 crew would exit out past the Mekong Delta to the South China Sea across the Philippines. His team of B-52s would fly at an altitude of 40,000 ft. to reduce fuel consumption. It took about 6 hours to fly back to Guam. A familiar sight upon returning to Guam was the runway guard, who would keep a lookout on for small deer that would wander onto the runway from the surrounding jungle. The guard’s job was to prevent the deer from being hit by the landing B-52s. Love the B-52? Support the restoration of our own B-52 and the building of our Vietnam Veteran's Commemorative Park!